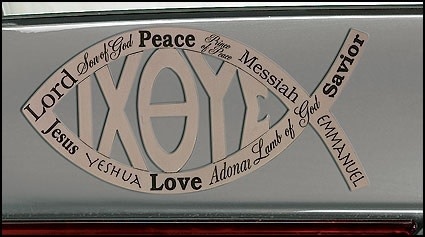 Give witness to your faith with our Names of Jesus Ichthus Auto Emblem. 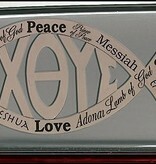 Includes many of the popular names of Jesus and the Greek word for "fish," which when spelled in capital letters in Greek is ΙΧΘΥΣ. Remember, Jesus called the fishermen to be fishers of men (Matthew 4:19; Mark 1:17). Jesus used the metaphor to represent evangelism in the proclamation of the gospel by which people are saved from their sins. Christians began using the fish as a symbol for Christianity in the first century.